Showing results for tags 'commercial glazes'. I love all the varied shapes a good mug comes in. The shape is my current favorite. 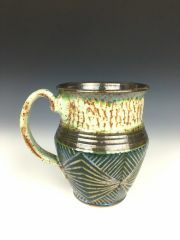 It works well to separate the textured areas from the geometric sgraffito in the bottom. It has a pulled handle and commercial glazes and was fired to cone 6 electric. 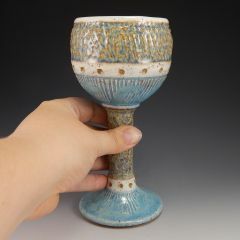 I throw the goblets in 2 parts then assemble them. They are some of my favorite pieces to make.